I used to not trust myself with clutches thinking that I would surely lose them or leave them behind in a cab/bar/anywhere. But come on and grow up Peter Pan-- this girl has got to be responsible enough NOT to lose her purse! I am putting full faith in myself to not lose my purse and entering the world of responsibility and clutch shopping. Doubtful I'll pull the trigger on a Clare Vivier anytime soon because I don't trust myself that much so I'll be taking some under $100 baby steps to get my feet wet. Side note: I did actually lose my wallet last week and a Good Samaritan found it running, found me on Facebook and Linkedin, emailed me to tell me had found it and then came to me to drop it off since I had a work event all day. He told me where he had found it and it was right outside of my house.... smooth move, Nicole. Anywho, just a story to share that good people still exist, people! Great choices, Nicole! 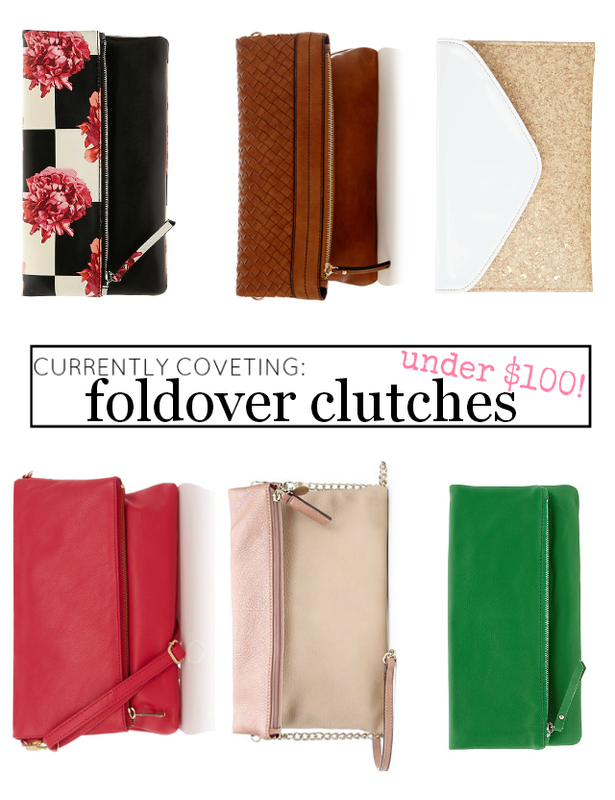 I like the shape of the gold and white one best, though I'm not sure if I'd buy a glitter clutch. I also really like the style of the tan one.